Updated: 12:05 p.m. 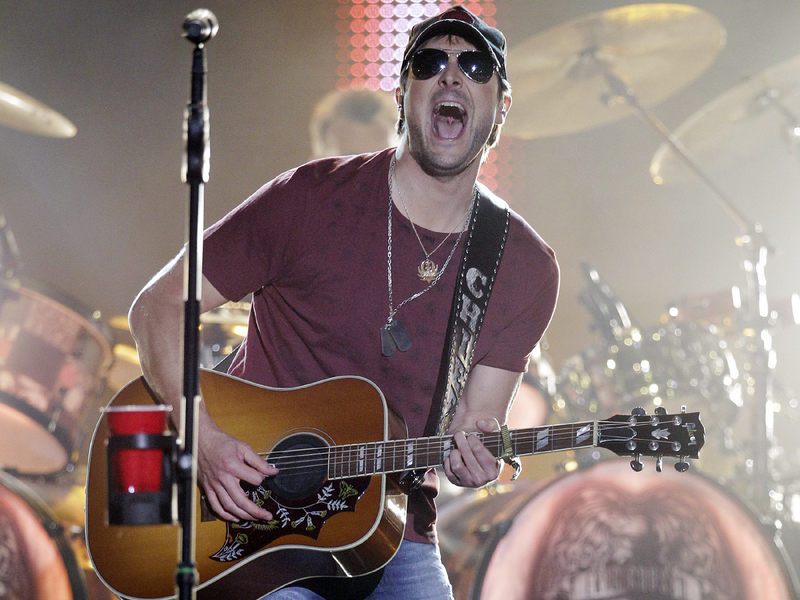 ET (CBS/AP) Eric Church leads this year's nominations for the Country Music Association Awards with five nods. The "Springsteen" singer is followed closely by Miranda Lambert and Blake Shelton. The husband and wife have four nominations apiece. Taylor Swift, meanwhile, will go for her third entertainer of the year award at this year's Country Music Association Awards, but she'll have to share the spotlight. There was little surprise as Swift, a two-time winner for the CMA's top award, was nominated in the category with previous winners Kenny Chesney and Brad Paisley and also Jason Aldean and Blake Shelton. There was a shake-up in other major categories, however, as rising stars Eric Church and Luke Bryan entered the mix for the first time. Bryan was clearly taken aback when his name popped up among nominees as he and good friend Aldean announced the first five categories Wednesday morning on "Good Morning America." Bryan entered this year's nominations with a splash, taking nods in two prestigious categories - male vocalist and album of the year. He and Church helped knock longtime nominee and multiple winner Paisley off the list of male vocalist nominees, joining Aldean, Shelton and Keith Urban. Bryan and Church also entered the list of album of the year nominees for the first time - Bryan for "Tailgates & Tanlines" and Church for "Chief." Other nominees in that category included Miranda Lambert's "Four the Record," Dierks Bentley's "Home" and Lady Antebellum's "Own the Night." Kelly Clarkson broke through in the female vocalist category, joining previous nominees Swift, Lambert, Underwood and Martina McBride. It's Clarkson's first individual CMA nomination. Lady Antebellum will go for its fourth straight vocal group of the year award against Zac Brown Band, The Band Perry, Little Big Town and Eli Young Band. Bryan was a late replacement for Lady Antebellum, whose flight to New York was delayed. He filled in with Aldean on "GMA," then moved over to the B.B. King Blues Club to announce the rest of the field.